Are We in LOVE with the Connectedness? What is love? What makes you fall in love? A lot of people tell me that love is the connection. Having the connection gives the feeling of belonging to a particular person or group. Communication is probably the key to create the connection. Our ancestors created languages for better communication and invented methods and tools to help with communication including, pigeon post, letter, telegraph, satellite technology, and the Internet. In 1980, memorable moments were made through satellite technologies. Two big screens were set up on the two sides the United States. 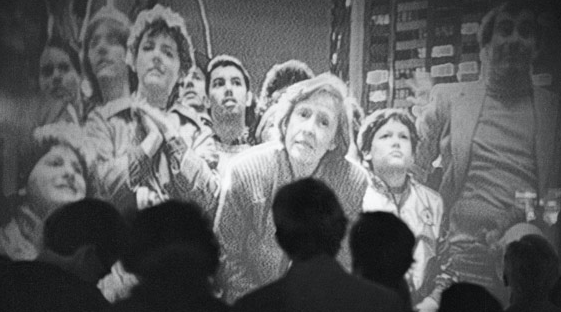 People at New York and Los Angeles had their live broadcasting for the first time with strangers, friends, and the loved ones. There were several emotional connections between people who were 2789 miles apart. I realized how beautiful connection is when I did the research at the beginning of the experimental interaction class on this piece of performance art, Hole in Space by Kit Galloway and Sherrie Rabinowitz. I named it The Mother of Facetime. 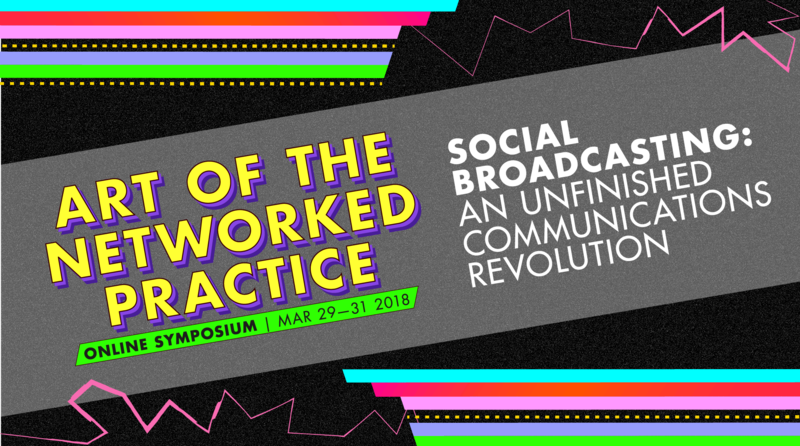 According to John Durham Peters, broadcasting is a tool used for dissemination, which the main source is spread to one large audience without the exchange of dialogue in between. The audience only has the choices to listen, analyze or just ignore the information. 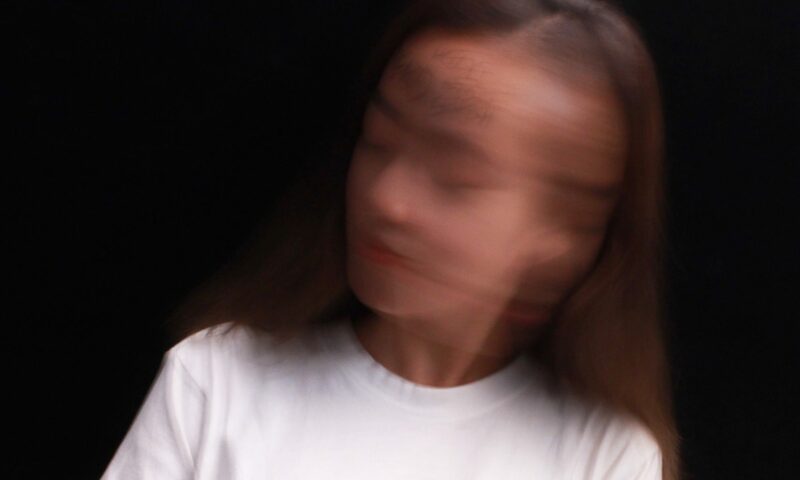 Over time, the centralized one-to-many broadcasting seems to be replaced by the peer-to-peer interactions that join the artist and audiences in the third space. For instance, the online Symposium, collaboration of the School of Art, Design & Media at Nanyang Technological University (Singapore), LASALLE College of the Arts (Singapore), and The School of the Art Institute of Chicago, Department of Performance (US). The three-day event from 29th to 31st March 2018, gathered international artists to share their artwork, thoughts and answered questions from the audience on Adobe Connect. On the first day, Annie Abrahams, the Scienartist I researched on in my previous short essay, created a performance during the online Symposium. The performance connected a group of international artists who stay in different countries. It started with them reading their latencies with the black screen and the blue frame flashing. Annie Abrahams mentioned that she gave freedom to the performer, as she only gives rules and there is no directing. Annie Abrahams also commented that we know that the performers are not in the same space and time, yet we can still make something with entanglement between machine and people. In the following scene, artists showed different objects in the similar framing on their screen. We can see the connection and similarity in framing although those items were actually far apart in different countries. Meanwhile, the conversation carried on in the chat room. Some were the clarifications of the performance from the hosts, some were questions, and some were just sharing thoughts. It seems to be outside of the performance but it somehow complimented it as the audience was able to connect and got to know others’ opinions. The decentralized and non-hierarchical modes of interaction gave the audience equal chance to connect with the artists and the other audience over the world. Further, I had a mini experiment on the first day of the online Symposium. 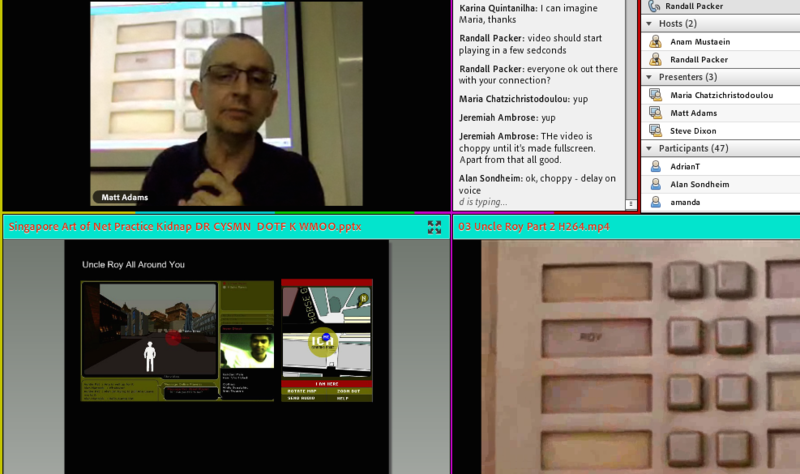 I decided not to join the chat room in the online Symposium, as I participated in Annie Abrahams’s online performance in my Experimental Interaction class organized by my professor Randall Packer. I would like to see the difference without participation. In the end, I found that I lost my interests and I actually felt excluded. My personal experience might not be enough to prove anything, but interaction is probably one of the keys to creating the connection in the “alternative social world”. Another example that created the connection is the game Uncle Roy All Around You by Blast Theory in 2003. During that period, online games were developed in new genres like social games, mobile games and etc. In this game, the online and street players collaborated to find Uncle Roy before being invited to make a commitment to a stranger. The street player held a mobile device that shows the real-time location and the online play could be able to see the street player and guide him or her to find uncle Roy. They communicated with each other via online text and audio messages. At the end of the game over 500 players out of 723 total players made a commitment to be there for another player for the next 12 months. Matt Adams shared with us on the second day of the online Symposium that this game gave people opportunity to play with the relationship that they might create. Some people treated it as a game while some think it was real and actually had commitments for over 12 months. How interesting that people could be connected easily in the third space. Numerous interesting artworks were made with the revolution of communication. Many memorable moments were captured. However, some said love without hate is not true love. 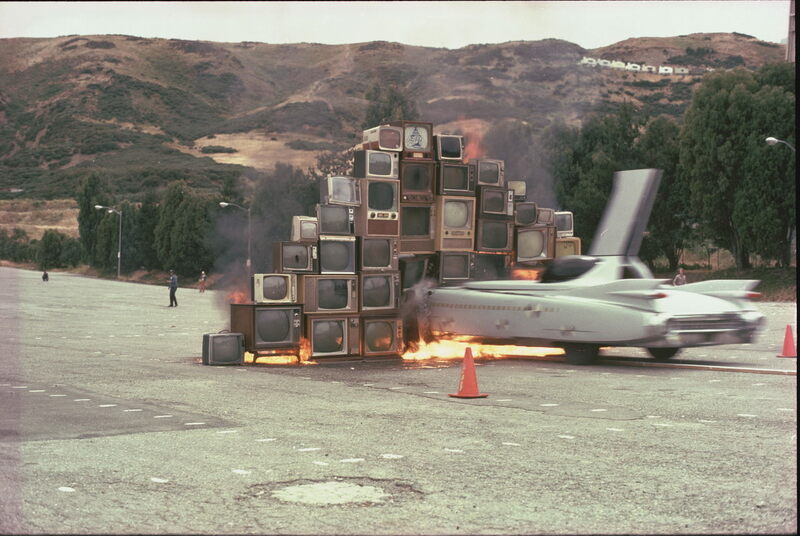 Back in 1975, artists from Ant Farm expressed their attitude towards the mass media through Media Burn, a performance art that a Cadillac drove through a mountain of television. My research on that artwork made me questioned: Haven’t you ever wanted to put your foot through your mobile phone? Since our daily life seems to be dominated by our phone and the internet. We are so attracted to the connections and interactions we can easily make in the third space. Everything seems so lively yet not seems 100% real, as some treats it as games while some actually make commitments just like how people view the game Roy All Around You. All in all, It is hard not to fall in love with someone or something you can connect with. It is hard to deny that the connection that interaction creates is beautiful and attractive. It is hard to change the reality that the third space is dominating our daily life. Many are obsessed with it, while some are against it. After going through the journey in Experimental Interaction class. I think the best solution so far of my own question “Haven’t you ever wanted to put your foot through your mobile phone?” is probably to build a new perspective to see the art of social practice. To see the beauty of connectedness we can build through those great human inventions. Very interesting how you expressed your thoughts on interaction in such personal terms: how we engage emotionally in the third space. This has been one of the key ideas we have discussed this semester, how meaningful interaction can be achieved despite geographical separation. Wasn’t this proved when you elected not to interact in the chat for Annie Abrahams’ performance, and found yourself removed and disconnected. This implies that is direct interaction that creates the quality of engagement in any form of interactive art. Perhaps it would be interesting and helpful to your thesis to applied this to Blast Theory’s work: how the players and performers engage in something dynamic, arresting, and challenging in both physical and virtual spaces. I didn’t completely understand the reference to Media Burn and your related statement to put your foot through a mobile phone. Perhaps you are suggesting that there can be so much mediation we cease to have positive connectedness? Bryan Leow on How is Your Vision? Daphne Ngatimin on How is Your Vision?